Can Diabetes During My Pregnancy Affect My Baby? Diabetes is a fairly common problem in pregnancy, affecting 6-7% of all pregnancies. About 85% of these women have gestational diabetes, or diabetes just during pregnancy. The other 15% had diabetes before they got pregnant. Many women with diabetes know that it can affect their pregnancy, raising their risk of pre-eclampsia (elevated blood pressure during pregnancy), labor difficulties, urinary and vaginal infections, Cesarean delivery, and other problems. But diabetes can also affect your baby. The most common effect of diabetes is macrosomia, or large infants. Technically, macrosomia is defined as newborns who weigh more than 4000 gm, or 8 lbs 13 oz. As many as 45% of infants of diabetic mothers are macrosomic, compared to 12% of newborns of non-diabetic mothers.1 These infants are also often referred to as large for gestational age (LGA). These infants are large because of fat deposition, not because of skeletal growth. They have larger shoulder and extremity circumferences, but their head size and length are not increased. Shoulder dystocia: the baby’s head is able to pass through the vaginal birth canal, but the shoulder is stuck inside the womb. Brachial plexus injury: an injury to the group of nerves that control the feeling and movement of the shoulder, arm, hand and fingers. Erb’s palsy: a specific type of brachial plexus injury that results in decreased movement of the arm and hand. Clavicle fracture: a broken collarbone suffered during the vaginal delivery. The good news is that the brachial plexus injuries, including Erb’s palsy, often resolve on their own in newborns, without any need for surgery or medication. And a clavicle fracture is usually treated simply by pinning the baby’s sleeve to the front of the shirt to prevent movement of that arm for a few weeks. In addition, macrosomic babies are more likely to experience hypoglycemia, or low blood sugar. This is the exact opposite problem of diabetes, which is high blood sugar. The high blood sugar in the mother causes the mom to produce a lot of insulin, which is then transferred to the baby. Once the high sugar content of the mom’s blood is stopped after the baby is delivered and the cord is clamped, then the high insulin causes low blood sugars in the baby.1 This may necessitate feeding the baby with formula or sometimes even an IV solution with sugar in it. This is one reason why macrosomic babies are more likely to require admission briefly to the NICU (neonatal intensive care unit). Macrosomic babies are also more likely to have neonatal jaundice, or yellow color.1 This is a very common problem for many reasons, and easily treated with a special kind of light therapy. But the news isn’t all bad. If you have diabetes, there are ways to treat it and keep your sugars under control. Most women don’t need any medication to treat their gestational diabetes, but can control it with diet and exercise. One meta-analysis of 42 different studies showed that a “package of care” combining medicine, diet, and exercise significantly reduced macrosomia, shoulder dystocia, pre-eclampsia, and need for Cesarean section.5 If you have diabetes and are planning on getting pregnant, here is some more information for you. 1 Kc K, Shakya S, Zhang H. Gestational diabetes mellitus and macrosomia: a literature review. Ann Nutr Metab. 2015;66 Suppl 2:14-20. 2 Agha MM, Glazier RH, Moineddin R, Booth G. Congenital abnormalities in newborns of women with pregestational diabetes: A time-trend analysis, 1994 to 2009. Birth Defects Res A Clin Mol Teratol. 2016 Oct;106 (10):831-9. 3 Pauliks LB. 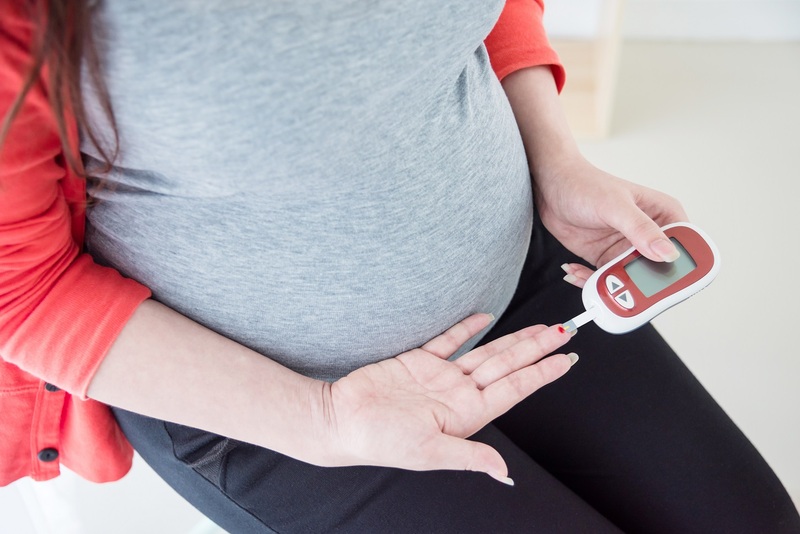 The effect of pregestational diabetes on fetal heart function. Expert Rev Cardiovasc Ther. 2015 Jan;13 (1):67-74. 4 Fraser A, Lawlor DA. Long-term health outcomes in offspring born to women with diabetes in pregnancy. Curr Diab Rep. 2014;14 (5):489. 5 Farrar D, Simmonds M, Bryant M, et al. Treatments for gestational diabetes: a systematic review and meta-analysis. BMJ Open. 2017 Jun 24;7 (6):e015557. Dr. Rucoba has over 25 years of experience as a primary care pediatrician after completing medical school at the University of California, San Francisco. His clinical areas of expertise include caring for children with special health care needs and assisting families with international adoption. He has been a freelance medical writer since 2010, writing for health websites, continuing medical education providers, and various print outlets. He currently works at Wheaton Pediatrics in the suburbs of Chicago, where he lives with his wife and four daughters, including a set of twins. Can A Fever During Pregnancy Harm My Baby?